The County of Nottinghamshire consists of approximately 835 square miles and houses a population of around 785,000 people. Gaza, on the other hand, comprises only 141 square miles yet is home to nearly 2 million souls. It is the most densely-populated land-mass on the face of the earth. The occupants of Gaza – their captive status barely qualifies them as residents – exist in a desperate world of poverty and squalor. Food and adequate medical provision is in dangerously short supply and in every way the contrast between Gaza – in reality, the world’s largest open-air prison-camp – and our own County of Nottinghamshire could not be greater. Gaza is ‘home’ to 800,000 children who are being shelled, shot and bombed by the world’s 4th largest military power. Civilian deaths on the Gaza strip are horrific; over eighty percent of all deaths are non-combatants. One wonders how Nottinghamshire residents would feel were they to find themselves evicted from their homes, their possessions and belongings stolen or destroyed, herded into Mansfield and prevented by force from leaving only to suffer the terror of bombs dropping upon their children as their schools, hospitals and playgrounds explode around them? 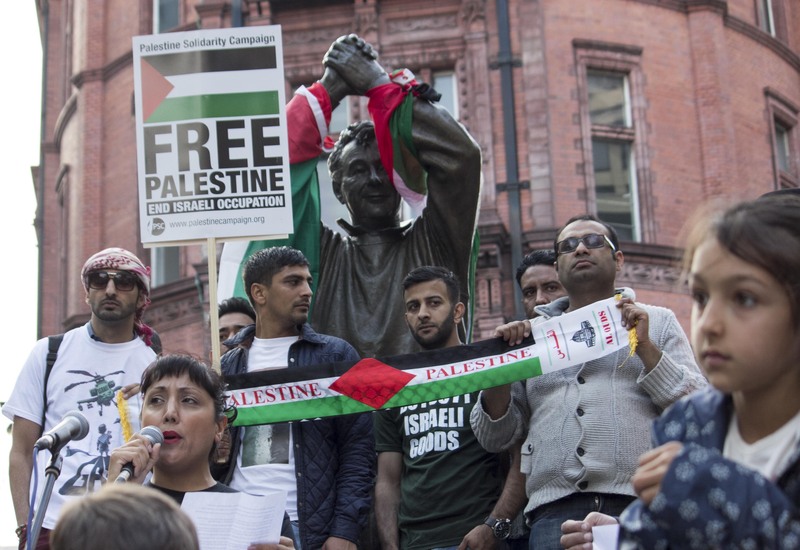 The Palestine Solidarity Campaign in Nottingham, with our colleagues across the UK, are not prepared to remain silent while this indiscriminate slaughter continues. For the last couple of weeks – joined by hundreds of Nottinghamshire residents – we have been protesting outside the BBC premises on London Road at the biased and inaccurate media coverage of the continuing massacre on the Gaza strip. Our members have been involved in meetings, petitions, protests and other activities, all designed to publicise the plight of the Palestinians and to raise awareness of the brutality of Israel’s continuing illegal occupation of Palestinian land and its murder of Palestinian civilians. This Thursday we will be marching from the BBC headquarters at 5.30pm to the City Council chambers on the Market Square. We will be presenting an official demand that the City Council boycotts all Israeli goods and services. We will demand our elected officials listen to the people they purport to represent and do the right thing for the people of Palestine. There are those who say that we have little chance of the City council joining our fight. They say that the UK’s support for Israel, and given our political class’s all-out austerity attacks on its own people, means that our politicians are fatally compromised and will not help. Again, we disagree. We believe that Nottingham Councillors are made of sterner stuff. We believe they will do the right thing and stand with us, on the side of the Palestinians. We believe they will join the boycott, along with their colleagues in other local authorities around the UK. After all, who among our Councillors would disagree with Desmond Tutu when he said, “If you are neutral in situations of injustice, you have chosen the side of the oppressor”?